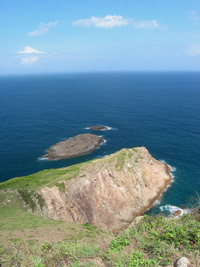 Tsui is a headland lying in the eastern corner of Sai Kung. 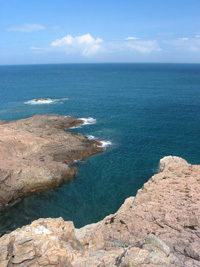 Stretching from Tung Wan Shan, it extends eastward to the Pacific Ocean. 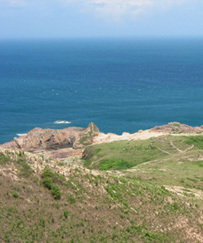 The headland can be reached by taking the major trail starting at the southeastern slope of Tung Wan Shan, either via Ham Tin or Mai Fan Teng. 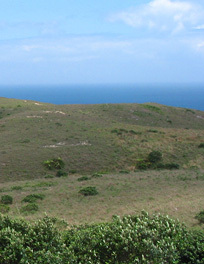 The trail follows along the ridge to the headland. 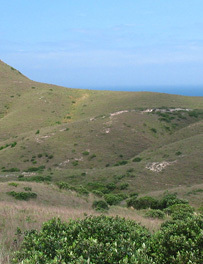 At the tip it turns and dips onto a grassland, an undesignated campground with seasonal supply of stream water, and then joins back to the main path. 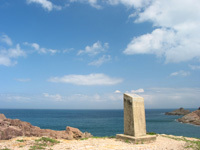 Alight at Sai Wan pavilion, take the concrete path by the map board and head to Chui Tung Au. 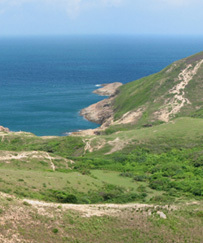 Join the MacLehose Trail Stage 2 and proceed to Ham Tin via Sai Wan. 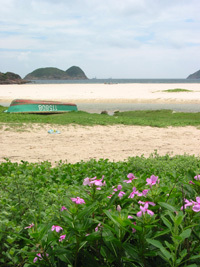 Take the small footpath behind Ham Tin Village and head to Tai Wan. 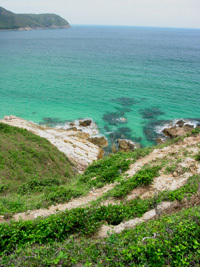 Follow the hidden path at the northern end of the Tai Wan beach and then continue on the path which then dips down to Tung Wan. 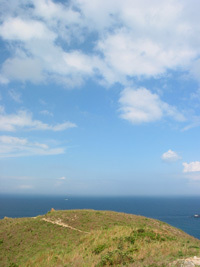 Take the path at the northeastern side of the lawn and follow the path at the middle slope of Tung Wan Shan. 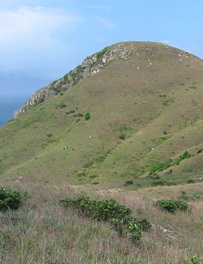 Turn right at the crossing and follow along the ridge of Cheung Tsui. 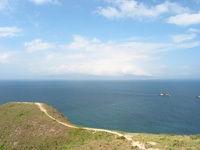 Make a left turn at the next crossing and descent to the undesignated campground. 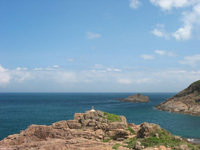 Take the gravelly path at the southeasterly direction and climb up to the tip of Cheung Tsui, where you can join the main path and head back to the path at the middle slope of Tung Wan Shan. 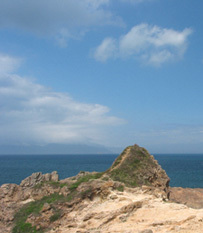 From there, take the downhill path by the big boulder. 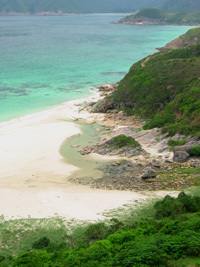 At the southwestern side of the Tung Wan beach, follow the hidden path by the cliff and return to the main path leading back to Tai Wan and Ham Tin Wan Village. 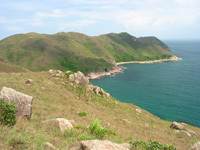 Follow the MacLehose Trail Stage 2 all the way to Chek Keng. 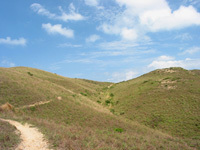 After passing the Chek Keng Village, take the right path at the crossing and proceed to To Kwa Ping. Turn left at the next crossroad and continue on the concrete trail to Uk Tau. 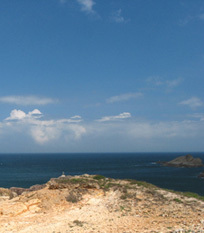 Take the ruined concrete path to the left at Chui Tung Au and go back to Sai Wan Pavillion. 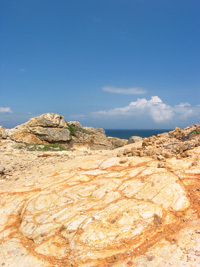 After arriving Ham Tin, follow the MacLehose Trail all the way to Chek Keng. 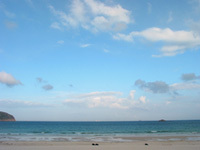 Leave by taking a ferry or speedboat at Chek Keng. 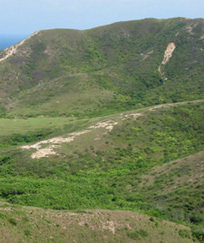 This lengthy trail is physically demanding. Parts of the trail are bushy and gravelly. 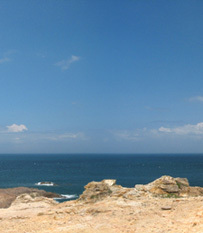 This long-distance hike requires a lot of physical effort. 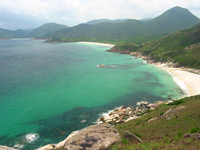 It passes some of the best beaches of Hong Kong and takes you to the tip of Cheung Tsui, enjoying an unobstructed view over Pacific Ocean.